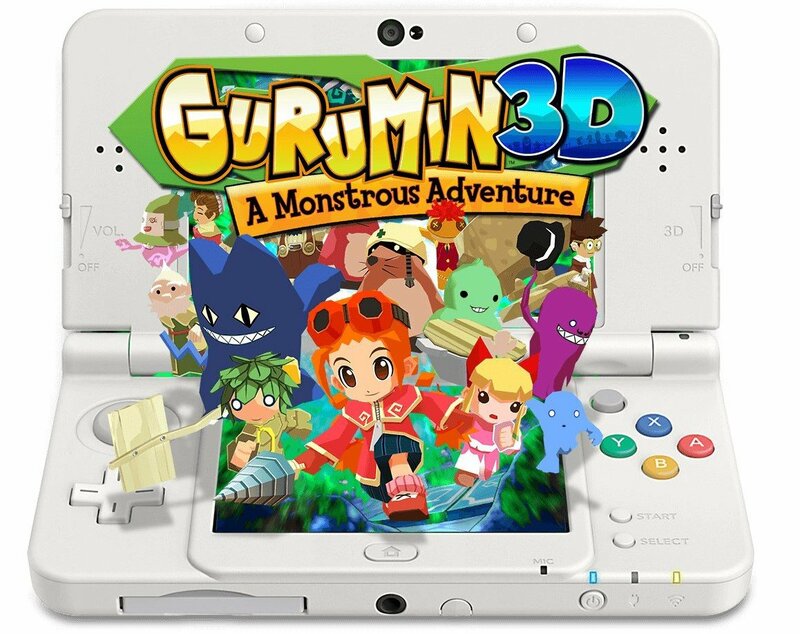 In the madness of E3 month some announcements can fall under the radar, and one that's been brought to our attention is the upcoming release of Gurumin 3D: A Monstrous Adventure on the 3DS eShop. Published by Mastiff, it's a 3DS version of a game that won a lot of plaudits on PSP and PC in the past. A 3D action platformer that had a spruced up 2015 release on PC through Steam, its 3DS version is going to feature stereoscopic 3D, c-stick camera controls on the New 3DS and additional outfits. Mastiff games President Bill Swartz has spoken to Siliconera about the decision to bring it to the eShop. The a-ha moment came a few years ago when a journalist described the game as "something between Zelda and Super Mario but with short range weapons." While I think no game in the world except for a Zelda or Mario could ever fully stand up to that description, I also think he was right. The game was a natural fit for the Nintendo audience and the large stages with lots of vertical and horizontal jumping seemed like a perfect fit for 3D. The accelerating popularity of the Nintendo eShop was the icing on the cake. It will be more than a year of development, but we think we have something that will do the hardware proud and fans will love. If you want a better idea of what this one's all about, the trailer below (using PC footage) should help. A 3DS trailer is due this week, too. It certainly looks rather promising, and is expected this Summer / Fall. Is it on your radar? With thanks to David for the heads up. Hm... the gameplay somewhat interesting. Some of voice actor / actress are recognizable. Dee Bradley Baker, as Numbuh 4 on Codename Kids Next Door. Tara Strong, as Timmy Turner Fairly Oddparents / Benjamin Tenison Ben 10 / Rikku FF X or X-2. This looks interesting. If it was originally for PSP, I suppose it should work well on 3DS. Looks interesting. A bit like those Japanese platformers from yesteryear (Klonoa, Bomberman Hero, etc). I hope it turns out to be good, but I would prefer it on Wii u. Well it's nothing like Zelda, it has voice acting. Looks fun, reminds me of the original Jett Rocket on Wii. Think I'll check it out on Steam. Its much more fun than Jett Rocket, its Zelda and Wonderboy mixed together. I owned it on my PSP back in 2008 and currently have it on my PC as well. Great game overall but my only issue with it were its constant frame dropping on PSP and locked 30fps on the PC version. Anybody getting a Braver Fencer Musashi vibe here lol. Looks interesting but ill wait for the reviews first. So this is only for New 3DS? Meanwhile on Wii U: Push the Button and Skeasy 2 MegaMix by RCMADIAX and Snap: The original card game by Skunk Software. Nice game but oh so very old. I played it on PSP many years ago. I hope it's priced well. Recommending it too. I liked the PSP version a lot. From what I've played, its quite fun. I have had in on my Vita for a while, but have not finished it. I have the PC version and even though it's pretty rough around the edges, it's a really fun and charming game. You can tell that it was created with love and care. I'll be getting the 3DS version when I can. @OorWullie that's just how the cookie crumbles. Low barrier of entry + little interest in the system = mostly shovelware. So wait, is it compatible with both 3DS and New 3DS? If it's just the latter, I guess I'll check out the PC version. Looks very nice n colourful and some awesome voice actors/actresses aswell definitely one too look out for. Definitely looks up my alley! I've been waiting anxiously since the first announcement! Summer is almost over, please release soon! Looks like it could be nice on new 3DS with some extras and good use of the 3D effect and a good price point. This actually looks pretty good. And D. Bradley Baker! Looking forward to this game! It's right up my alley! I already bought it on Steam, and I've barely played it. It seems cool, but I'm not exactly gonna buy it again. I'm surprised actually that a lot of the gems on the PSP haven't been ported over to the 3ds over the years (only one or two I think?). Heard about this from a gems list somewhere online a few months back, 'found' a copy of it, but haven't played it yet, but sure now I'll hold out for a eshop copy of course! Looks like it'll be a really fun game on the 3DS. Great. Falcom is one of my favourite developers. They know how to make fun gameplay and catchy soundtracks. I hope we see the Ys-series on Nintendo consoles too in the future. Gurumin is actually quite unusual Falcom-game, since the company usually makes action-rpgs or traditional rpgs. @Spoony_Tech I was actually just about to say it had more of a Brave Fencer Musashi feel to it than any other game. Here's hoping this new version does well. God I love the way it looks! I sure hope it's not too messy a port. I'd love to have this on 3DS. you know by looking at this game, i have to wonder if Nihon Falcom is capable of developing a Mega Man Legends game for Capcom or not. i know Capcom can burn in hell for cancelling Legends 3 but still, just a thought. This looks... not bad, actually! Interested to learn more. Between this and the Dark Witch 3 announcement it's been a pretty good couple of days in 3DS-land. I have the game on Steam, and it's actually pretty good, although a bit short and repetitive at times. I hope the 3DS version does well enough for the developers to consider a sequel. Nice! I didn't play this on PSP, didn't even hear about it. Will be picking it up on 3DS for sure. Some strong voice acting lineup there. The artstyle kinda similar to Windwaker though. Now that every one's mentioning it the cheesy dialog does remind me Brave Fencer Musashi. Oh yes, Gurumin is absolutely brilliant. Hands-down my favourite PSP game. It's super fun and charming with a lot of replay value and some surprisingly high challenge later on. Highly recommend it, this game deserves far more love. Sad part is, I brought this on sale in a humble bundle deal (Steam) and never played it yet. Can't tell if I'll double dip on it. @ultraraichu I did the same, might get it on the 3DS if it plays well and has good 3D. Prefer playing on handhelds most of the time. I have this on PSP but haven't got around to playing yet. Looks fun and I would buy the game if I didn't own it already. The gameplay looks unique and interesting and the voice actors pique my interest further. However, the game looks terrible. Still might get it if it comes to NA.